The best mushroom to use in this recipe is the Portobello, or something similar, as they have good, deep caps capable of coping with a jolly good stuffing. A generous amount of filling is key here, though it may not sound like the most frugal approach – what’re a few pennies if they stand between you and a fine breakfast? Continuing with the theme of dark, rich flavours and textures, I highly recommend using a granary sourdough for this recipe. Of course, if there’s nothing else available then plain white is acceptable, but it’s always favourable to get a base that enhances its topping. Indeed, a hunk of powerful, mature cheddar is necessary here – no one wants a weak-willed and mild lump of fat straddling their gorgeous meal. In any case, though ingredients with bags of flavour tend to cost a little more, they go further and last a little longer, thus saving money over the course of a week or two. 1. Roast your mushrooms at 180C for around 15 minutes. Meanwhile, heat a knob of butter in a pan and wilt the spinach together with a pinch or two of nutmeg, season to taste. Toast the bread. 2. Bundle the spinach generously into the roasted mushrooms. Place atop the toast and scatter cheese on top. Grill until cheese is melted and has started to brown. Enjoy immediately! Cost: Portobello mushrooms may look the part, but really they’re nice and frugal at around 30p a piece. The rest of the ingredients aren’t too pricey here – even good cheddar can be had at a reason price in Britain. Indeed, the entire breakfast for two set us back no more than around £2.20. This one is definitely up my alley, I adore mushrooms and add spinach and cheddar? A match made in heaven with the humble assistance of butter, of course. Portobello’s are generally HUGE here (they are usually substituted for steak for vegetarians) so I can’t say I’ve seen many this small size, but I shall keep my eyes open. They are so lovely when cooked! I dare say I could do this in the large size and top it off with a poached egg for a tasty breakfast. The flavours work so well together. Over here we get huge and small ones. That would work extremely well, this just made more sense for the toast! I have a serious love for mushroom caps – add in some toasted sourdough bread and well, I just might faint with pleasure. Looks fab! 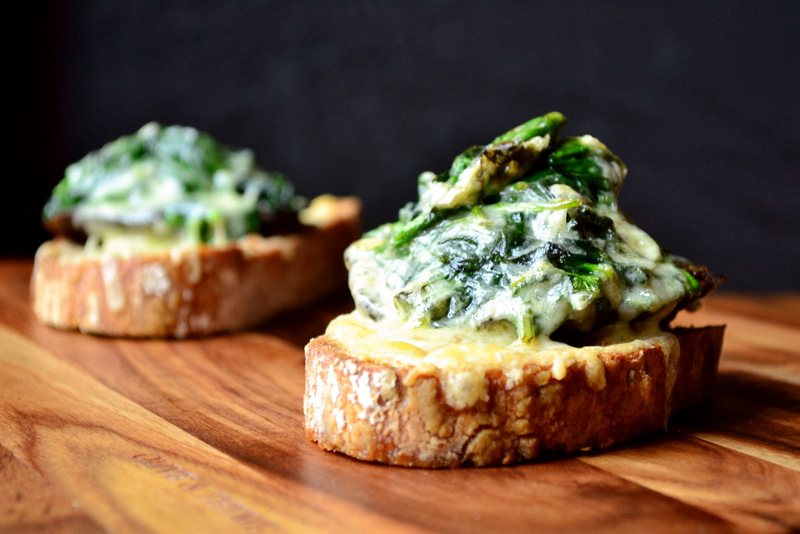 Fabulous combination… spinach and cheese, yum… and stuffed into great big meaty mushrooms, even yummier! Mmmmm, I bet they were! Haha, thanks! That sounds amazing, can’t wait to start making my own sourdough. I think Somer can make anything vegan! Only one thing to say…. NOM! LOVE..love love it!! I usually use my stuffed mushroom left overs in a sandwich and toast it in my toaster oven. But can’t wait to serve it this way as a nice lunch option. That sounds delicious too! Thanks. It is the perfect combo! Yes yes yes! This is so right! This looks so good! I have everything to make it right now and was wondering what was for dinner….wonder no more! Just poured myself a lovely glass of red. I’d like these with my wine tonight. 🙂 Delicious! Hahaha! Awww… so sorry! Lots of water and beet juice. And of course some very strong coffee. Funny thing is, I had a bottle of champagne last night… I hate beets too. Hehe, thanks Cecilia! Share and share alike! OH a slice is definitely necessary, especially if the slice is this amazing granary sourdough. Great healthy snacks, easy too. Thanks for the recipe. I’m so hungry atm and these look so good, mmm! They are so quick too! That looks delicious, and probably would make great hors d’oevres too. This looks like an A–1 breakfast… Very tasty and even elegant. Excellent! Oh it was! Good lunch too – thankS! Oh my! You’ve done it again! Just love the pics and the description. And I love mushrooms too! I’m gg to change to homecooked food soon cos of you. Definitely gg to be frugal when I grow up…! Great post…again. Gg to share this with my friends as well. It was delicious tasting too! Looks very tasty! I may want to make this in about 2 weeks for some guests. Is it okay if I post it on my blog, and pin your blog back to the recipe? (I will give you full credit). Love mushrooms! Thanks for the great idea! The fact that I can’t eat mushrooms absolutely KILLS me when I see this. how could this NOT be utterly, soulfully dee.lich.ious? Haha – one of the best breakfasts ever! Fantastically Melty! That’s such a lovely breakfast! Your recipes are stellar, but what really makes me smile is your writing. Love your style on both accounts! Thank you – that’s so lovely to hear! Ooooh. I am drooling over this one. I am not familiar with a “knob of butter”. Is a knob a specific package size? Like here we have “pats” . . . a pat of butter . . . Is there a comparison you could give me so I could have a better idea? I am curious. I am sure I can figure out how much butter to use, but I am curious about the phrase. This is just such a delicious recipe! I’m going to try it this week. Don’t make too much mess… A knob of whatever you want it to be. Though if it is precision you’re after, try 15g :D.
Looks super yummy, Nick! This reminds me of a snack I used to make with goat cheese and portabello mushrooms. I should resurrect that. It was tasty! Oh yum, that does sound good, very good. Lovely idea for my breakfast, open stuffed mushrooms, mature cheddar, topped with a perfectly poached egg on sourdough bread, gorgeous, love it. I’ve been on muesli for a few weeks. And while I’m enjoying it (trying to slim down), I’d rather be eating this!